This article first appeared in Forum, The Edge Malaysia Weekly, on December 26 – January 1, 2016. THE YEAR 2016 is about over. It was a year of surprises globally, what with terrorist attacks in Europe, the refugee flows into Europe from the Middle East, Brexit, the election of Donald Trump as the next US president, and so on. For Malaysia, it was allegations and investigations, and sackings and jailings surrounding the 1Malaysia Development Bhd (1MDB) investment fund run by Prime Minister Datuk Seri Najib Razak that were given the most column inches and the most browser space in the traditional and social media. Tied to this was the low-key celebration of the 70th anniversary of the founding of the dominant party, the United Malays National Organisation (Umno). This should not surprise observers since the party has in fact been plagued by serious internal strife and its president has been under tremendous pressure to explain the goings-on involving 1MDB. Sadly, the 1Malaysia slogan that he so hopefully adopted after taking power in 2009 is now cause for ridicule and criticism. A totally new political scenario has been building up over the last two years, and despite Najib’s and Umno’s amazing ability to survive challenges that in most other countries would have seen a change of government many times over, there is likely little chance that the ruling coalition can increase its voter support. Umno’s challenges are serious indeed, and they have been coming fast and furious. We saw the removal, among others, of its deputy president Tan Sri Muhyiddin Yassin as deputy prime minister in June 2015 and his sacking from the party in July 2016. Since then, Muhyiddin has joined former prime minister Tun Dr Mahathir Mohamad, who had resigned from the party in February 2016 after his son Datuk Seri Mukhriz Mahathir was dumped as menteri besar of Kedah. Mukhriz was later sacked from the party along with Muhyiddin. In September, these three, together with other former Umno members, formed a new Malay-based party, Parti Pribumi Bersatu Malaysia (PPBM). And on Dec 13, PPBM most significantly signed an electoral agreement with the opposition coalition, Pakatan Harapan. Over in Sabah, Shafie Apdal, the Umno vice-president who was removed from the Rural and Regional Development portfolio when Muhyiddin lost his Cabinet position in July 2015, formed an opposition party of his own, the Sabah Heritage Party (Warisan). And lest we forget, Mahathir and Datuk Seri Anwar Ibrahim have shaken hands publicly in what should be seen as the maximal level of conciliation one can expect for now between the two leaders, who now find themselves fronting the oppositional forces arrayed against Najib. And with that, the political stage is more or less set for 2017. What Malaysia watchers will be looking out for in the coming months will be an announcement by the prime minister on the dissolution of Parliament and subsequently the date for the 14th general election. This will immediately set in motion an avalanche of activity among the opposition parties. Negotiations for seats and constituencies should have all been concluded by then. Where the Barisan Nasional parties are concerned, their preparations for the election campaign tend to start much earlier and on the sly, although customarily, news of these leak out as vendors are tasked with orders to provide them with campaign paraphernalia. 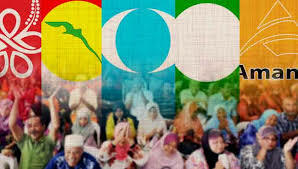 While Malaysian politics may have always been about inter-ethnic divides, the new stage on which the 14th general election will be performed will manifest the political crossroads at which the Malay community — and therefore Malaysia in general — finds itself today. With the size of the non-Malay population sharply diminishing over the years, coupled with the urbanisation and the rise in educational levels of the very young Malay community as well as the disruptions to information control wrought by social media and the internet, the political arena is now one where the fiercest and most decisive battles are fought between Malay leaders and Malay groups. The continued use of the Chinese and DAP bogeyman aside, the deep trenches are within the Malay community. This should not be unexpected, and in many ways are the long-term result of the successes of the New Economic Policy. At the same time, and just as unexpected, many of the issues plaguing the Malay community are in essence about the worst negative consequences of the NEP and the debilitating culture of privilege, patronage and entitlement that it facilitated and that has come to infect the institutions of government. In that very real sense, the coming election is a battle for Malaysia’s future, a battle that will decide whether or not Malaysia will have a future reminiscent in some way of Vision 2020. Leaving behind the old bogeymen and old defences in order to confront underlying realities is the difficult psychological and political dilemma that the Malay community, now clearly divided into two equal camps, needs to resolve — and quickly. And after the election, working towards a conciliatory and viable solution that will enhance the national economy on the global stage will be the big challenge for Malay leaders on all sides. Ooi Kee Beng is the deputy director of ISEAS-Yusof Ishak Institute in Singapore. His latest books include Merdeka for the Mind: Essays on Malaysian Struggles in the 21st Century (SIRD 2015).